In order for enterprises and IT organizations to truly innovate and offer differentiated value to customers, you need an IT infrastructure based on the latest advancements in computing, networking, and storage. Considering an investment in flash storage or converged infrastructure? 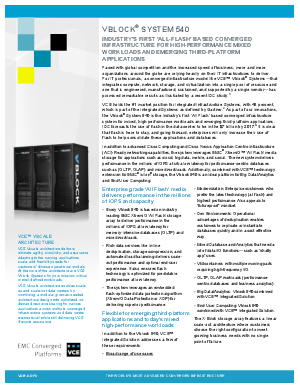 Read this brochure to learn more about the Vblock® System 540, the industry’s first all-flash Converged Infrastructure System for high-performance mixed workloads and emerging 3rd platform applications—built on best of breed technology components including EMC XtremIO all-flash storage. All of this with the VCE™ Experience of unmatched management and one-call support.